The festival of lights is nearly upon us. 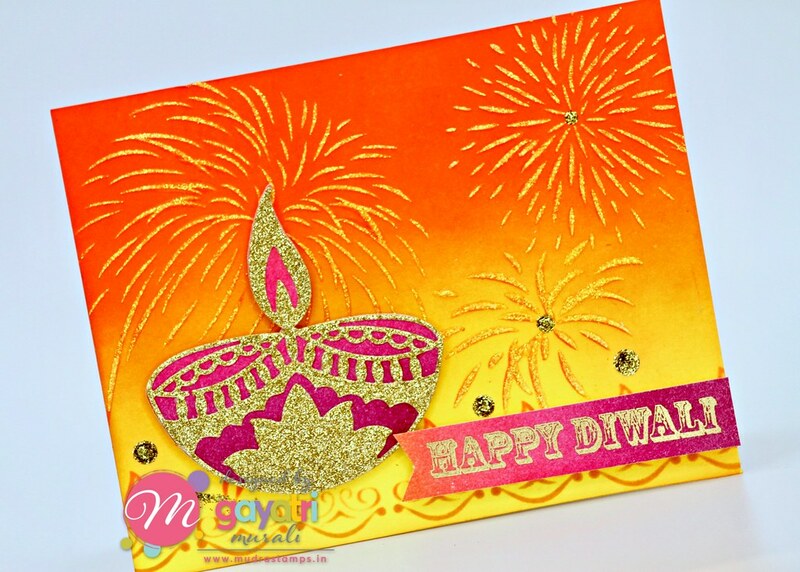 Diwali is a major festival of India. Its called the festival of lights in North of India. In south of India, this festival is celebrated as Lord Krishna slays the demon Naraka on a special day of Chartudasi from the Hindu mythology. Either way, Diwali symbolised victory of light over darkness. It is a very special and significant festival. Hello everyone, Welcome to my blog. 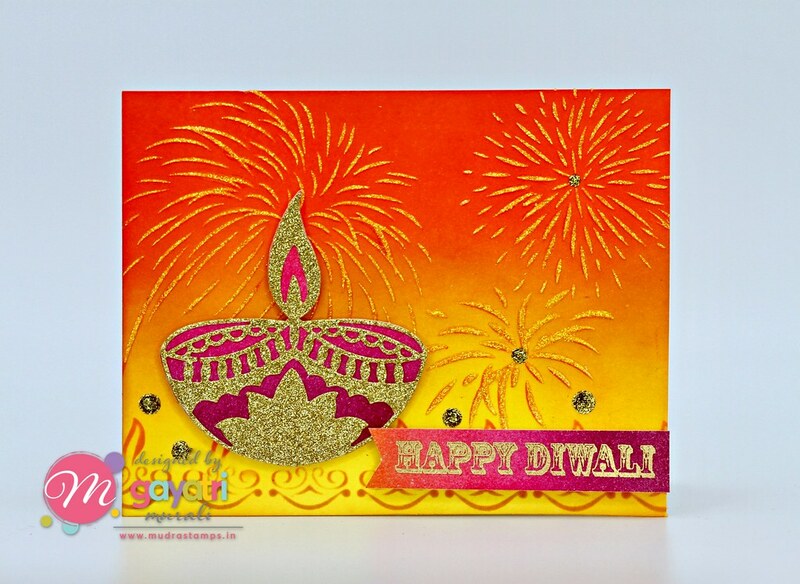 I have my first Diwali card for this year. I have a few coming this week. All the products I used to make my card today comes from Mudra Craft Stamps. I will list all the supplies I used to make this card towards the end of this post. But first here is the card. I used distress inks to sponge the background of the card front. The colours used are Mustard Seed, Ripe Persimmon, Spiced Marmalade, Carved Pumpkin and Candied Apple. Then I used Mudra’s Diya stencil to sponge Fossilised Amber and Ripe Persimmon and make a border on the bottom of the background. Then using the Crackers stencil to sponge Spiced Marmalade distress inks and then Nuvo Moonstone glimmer paste on top to add texture and sparkle to the fireworks. The focal die is the new Diya die. This die has the solid Diya die as well as the decorative detail dies for both the lamp as well as the light. I sponged a scrap piece of white cardstock with Picked Raspberry and Seedless Preserve distress inks. I die cut the solid diya using this sponged panel. The decorative detail die is die cut using gold glitter cardstock. I layered glued the decorative detail on the solid die cut and foam mounted on the left side of the card front. The sentiment is from Crackers stamp set. 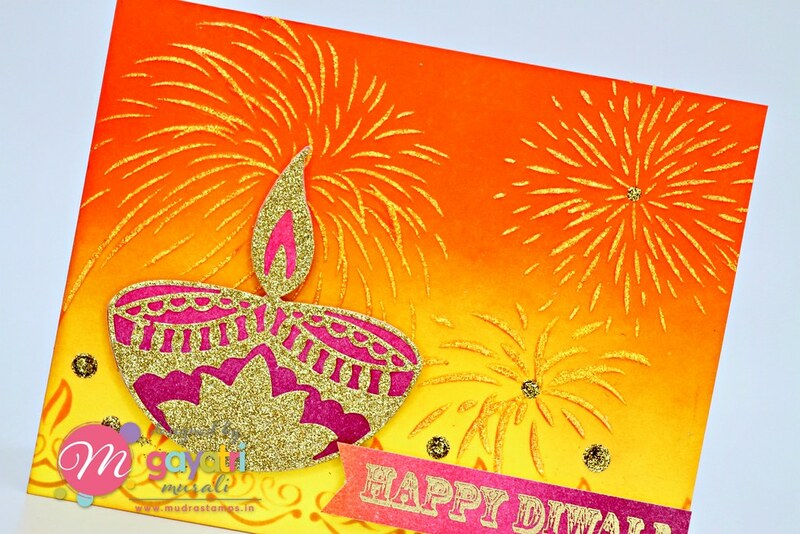 I gold heat embossed this sentiment on the leftover piece of cardstock sponged with distress inks used to die cut the Diya. I trimmed the sentiment cardstock and adhered on the left side using foam adhesives. Finally a few gold stickles to finish off the card. Rich colours are part of Indian tradition. Hence the choice of colours on my card. Hope you like my card and got inspired. Thanks very much for visiting my blog today. Beautiful!!! You have totally bought the festive feel in this card!!! Amazing card. Thanks for introducing me to this company. I going to order anything and everything that is Diwali.